ICW’s Tablet Mount adjusts to fit many popular tablet sizes. 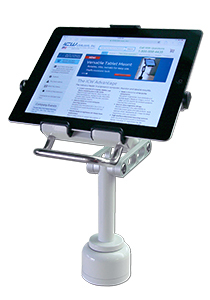 Its articulating stand has exceptional range of motion so you can adjust your tablet to any viewing angle. It’s an excellent solution for retail points of sale, self-serve kiosks, healthcare, dental and industrial applications. The mounting arm rotates 330º at both joints and swivels 360º at the base. The tablet also rotates 360º. The mounting arm raises up to 16.6″ (42 cm), lowers and folds compactly out of the way. Convenient handle makes adjusting the tablet easy and protects it from damage. Requires custom ICW key for tablet removal. Tablet secures to plate with adjustment knob. Does not include theft resistant fastener. Does not include stand. Includes both adjustment knob and theft-resistant fastener. Spring loaded cradle expands and contracts to fit many tablet sizes. See product specifications sheet for dimensions. Adjusts 16.6” (42 cm) vertically, swivels 360° and tilts to any viewing angle. Rotates easily from portrait to landscape mode. Commercial grade quality with a 5 year warranty.